Virginia Elizabeth "Geena" Davis (born January 21, 1956) is an American actress, film producer, writer, former fashion model, and former archer. She is known for her roles in The Fly (1986), Beetlejuice (1988), Thelma & Louise (1991), A League of Their Own (1992), The Long Kiss Goodnight (1996), Stuart Little (1999), and The Accidental Tourist, for which she won the 1988 Academy Award for Best Supporting Actress. In 2005, Davis won the Golden Globe Award for Best Actress – Television Series Drama for her role in Commander in Chief. In 2014, she returned to television portraying Dr. Nicole Herman in Grey's Anatomy. She was nominated for an Academy Award for Best Actress along with her co-star Susan Sarandon for Thelma and Louise. Davis is currently starring as Regan MacNeil/Angela Rance in the horror television series The Exorcist. Davis was born January 21, 1956, in Wareham, Massachusetts. Her mother, Lucille (née Cook; June 19, 1919 – November 15, 2001), was a teacher's assistant, and her father, William F. Davis (November 7, 1913 – April 2, 2009), was a civil engineer and church deacon; her parents were both from small towns in Vermont. She has a brother named Danforth ("Dan"). At an early age, she became interested in music. She learned piano and flute and played organ well enough as a teenager to serve as an organist at her Congregationalist church in Wareham. Davis attended Wareham High School and was an exchange student in Sandviken, Sweden, becoming fluent in Swedish. Enrolling at New England College, she graduated with a bachelor's degree in Drama from Boston University in 1979. Davis is a member of Mensa, a social organization whose members are in the top 2% of intelligence. Following her education, Davis served as a window mannequin for Ann Taylor until signing with New York's Zoli modeling agency. Davis was working as a model when she was cast by director Sydney Pollack in his film Tootsie (1982) as a soap opera actress. She followed the role with the part of Wendy Killian in the short-lived television series Buffalo Bill, which aired from June 1983 to March 1984. She also wrote the Buffalo Bill episode entitled "Miss WBFL." During the run of Buffalo Bill, in 1983, Davis also appeared as Grace Fallon in an episode of Knight Rider entitled "K.I.T.T. the Cat". Her television credits from the mid-1980s also include one episode of Riptide, three episodes of Family Ties, and an episode of Remington Steele. This was followed by a series of her own, Sara, which lasted thirteen episodes. After roles in Fletch, The Fly, Beetlejuice, and several other movies Davis received an Oscar as Best Supporting Actress for her appearance in The Accidental Tourist (1988), and a Best Actress nomination for her role in Thelma & Louise (1991). Davis replaced Debra Winger in the role of Dottie Hinson in A League of Their Own (1992), and received a Best Actress Golden Globe Award nomination for her performance. She then co-starred in Hero alongside Dustin Hoffman and Andy Garcia. Davis then teamed up with then-husband, director Renny Harlin, for the films Cutthroat Island and The Long Kiss Goodnight (both 1996). She and Harlin co-produced the films. Davis was nominated for the Saturn Awards for her performances as Samantha/Charlie in The Long Kiss Goodnight, and as Eleanor Little in Stuart Little (1999), a role she reprised in 2002 and again in 2005. In 2000–2001, Davis starred in the short-lived sitcom The Geena Davis Show. In early 2004 she guest-starred as Grace Adler's sister, Janet, on the NBC sitcom Will & Grace. She went on to star in the ABC television series Commander in Chief, portraying the first female President of the United States. This role garnered her a Golden Globe for Best Actress in a Drama Series in 2006, and she also was nominated for an Emmy Award and a SAG Award for Outstanding Female Actor in a Drama Series. Also in 2006, she was awarded the Women in Film Lucy Award. She starred in the Australian-produced, American-set Accidents Happen, which was released in April 2010. During the 11th season of Grey's Anatomy, Davis played a recurring role as Dr. Nicole Herman, who is an attending fetal surgeon who has a life-threatening brain tumor. In October 2015, it was announced that Davis would be starring in the film adaptation of Marjorie Prime alongside Jon Hamm. On September 1, 2001, Davis married Reza Jarrahy (b. 1971), an Iranian-American plastic surgeon. They have three children: daughter Alizeh Keshvar Jarrahy (born April 10, 2002) and fraternal twin sons Kian William Jarrahy and Kaiis Steven Jarrahy (born May 6, 2004). The marriage is Davis's fourth. She was previously married to Richard Emmolo (1982–83); actor Jeff Goldblum (1987–90), with whom she starred in three films, Transylvania 6-5000, The Fly, and Earth Girls Are Easy; and Renny Harlin (1993–98), who directed her in Cutthroat Island and The Long Kiss Goodnight. 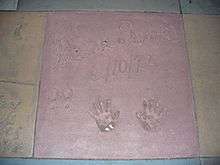 The handprints of Geena Davis in front of The Great Movie Ride at Walt Disney World's Disney's Hollywood Studios theme park. Davis is fronting the Women's Sports Foundation campaign Geena Takes Aim in support of Title IX, an Act of Congress focusing on equality in sports opportunities, now expanded to prohibit gender discrimination in United States' educational institutions. In 2004, while watching children's television programs and videos with her daughter, Davis noticed an imbalance in the ratio of male to female characters. Davis went on to sponsor the largest research project ever undertaken on gender in children's entertainment (resulting in 4 discrete studies, including one on children's television) at the Annenberg School for Communication at the University of Southern California. The study, directed by Dr. Stacy Smith, showed that there were nearly 3 males to every 1 female character in the nearly 400 G, PG, PG-13, and R-Rated movies the undergraduate team of Annenberg students analyzed. Geena Davis speaking at Bates College on May 31, 2009. In 2005, Davis teamed up with the non-profit group, Dads and Daughters, to launch a venture dedicated to balancing the number of male and female characters in children's TV and movie programming. Davis launched the Geena Davis Institute on Gender in Media in 2007. The Institute's first focus is an on-the-ground program that works collaboratively with the entertainment industry to dramatically increase the presence of female characters in media aimed at children and to reduce stereotyping of females by the male-dominated industry. For her work in this field she received an honorary Doctor of Fine Arts degree from Bates College in May 2009. In 2011, Davis became one of a handful of celebrities attached to USAID and Ad Council's FWD campaign, an awareness initiative tied to that year's East Africa drought. She joined Uma Thurman, Chanel Iman and Josh Hartnett in TV and internet ads to "forward the facts" about the crisis. In 2015, Davis launched an annual film festival to be held in Bentonville, Arkansas, to highlight diversity in film, accepting films that prominently feature minorities and women in the cast and crew. The Bentonville Film Festival took place from May 5–9, 2015, and began accepting submissions on January 15. In July 1999, Davis was one of 300 women who vied for a semifinals berth in the U.S. Olympic archery team to participate in the Sydney 2000 Summer Olympics. She placed 24th of 300 and did not qualify for the team, but participated as a wild-card entry in the Sydney International Golden Arrow competition. Davis has stated that she was not an athlete growing up and that her introduction to archery was in 1997, two years prior to her tryouts. 1983 Knight Rider Grace Fallon "K.I.T.T. the Cat"
1984 Riptide Dr. Melba Bozinsky "Raiders of the Lost Sub"
1984–86 Family Ties Karen Nicholson "Help Wanted", "Karen II, Alex 0", "A Word to the Wise"
1985 Remington Steele Sandy Dalrymple "Steele in the Chips"
1989 Trying Times Daphne "The Hit List"
2004 Will & Grace Janet Adler "The Accidental Tsuris"
2015 Annedroids Student "Undercover Pigeon"
↑ Winfrey, Oprah (December 2006). "Oprah Interviews Geena Davis". O. Hearst Corporation. Retrieved October 5, 2015. 1 2 "OLYMPICS; Geena Davis Zeros In With Bow and Arrows". NY Times. 6 August 1999. Archived from the original on June 12, 2015. Retrieved December 24, 2015. ↑ "Editor's notes: Fish out of water". ↑ "Trends in Photography". Los Angeles Times. July 14, 1989. ↑ "Mensa USA web site". Us.mensa.org. 2011-03-31. Retrieved May 18, 2014. ↑ "Davis bio at Yahoo Movies". Movies.yahoo.com. Retrieved August 21, 2011. ↑ Joe Brown (July 3, 1992). "'A League of Their Own' (PG)". Washington Post. Retrieved December 24, 2015. ↑ "Geena Davis Would Love to Be Part of a 'Beetlejuice' Sequel". BloodyDisgusting. ↑ "Geena Davis on Playing Opposite Jon Hamm in MARJORIE PRIME, 'I'm Excited!'". Broadway World. October 11, 2015. Retrieved December 24, 2015. ↑ "Mothers Over the Age of 40: PEOPLE". People magazine. April 19, 2002. Retrieved August 21, 2011. ↑ Blash, Margi (May 31, 2004). "Hollywood Baby Boom". People.com. Retrieved August 21, 2011. ↑ Silverman, Stephen M. (September 5, 2001). "Geena Davis a Bride for Fourth Time". People.com. Retrieved August 21, 2011. ↑ Smith, Stacy L.; Choueiti, Marc; Pieper, Katherine; Gillig, Traci; Lee, Carmen; DeLuca, Dylan. "Inequality in 700 Popular Films: Examining Portrayals of Gender, Race, & LGBT Status from 2007 to 2014". ↑ Burch, Ariel Z (March 15, 2008). "Geena Davis: In a league of her own". Retrieved June 12, 2012. ↑ "Geena Davis Institute on Gender in Media". Thegeenadavisinstitute.org. Retrieved August 21, 2011. ↑ "List of 2009 Bates honorands at Bates College web site". Bates.edu. April 9, 2009. Retrieved August 21, 2011. ↑ "Dr. Jill Biden Joins USAID and Ad Council to Debut FWD Campaign for the Crisis in the Horn of Africa". PR Newswire. October 26, 2011. 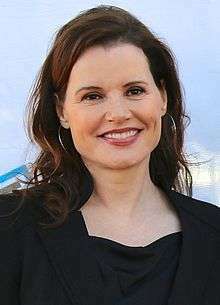 ↑ "Geena Davis Launching Bentonville Film Festival to Push for Diversity in Film". Variety. Retrieved January 6, 2015. ↑ "Geena Davis still causing commotion in archery". CNN. September 21, 1999. Retrieved May 3, 2010. ↑ Litsky, Frank (August 6, 1999). "OLYMPICS; Geena Davis Zeros in With Bow and Arrows". The New York Times. Retrieved May 3, 2010. "Geena Davis collected news and commentary". The New York Times.